When it comes to Desktop clutter, I belong to the do-as-I-say-not-as-I-do class of Mac experts. I know a Desktop packed with icons can slow down your Mac and make for a poor screenshot- and presentation background, yet I still treat it as my default dumping ground. Jörn Hartmann comes to my aid with his 99-cent TidyTop (Mac App Store link). It works like this: Install TidyTop and a TidyTop menu appears in the Mac’s menu bar. 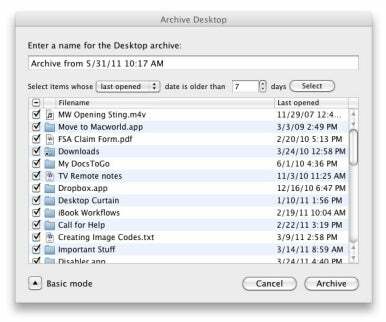 Click on the menu and select the Archive Desktop command. In the resulting window, click the Advanced Mode button and choose which Desktop items you want to make disappear from your Desktop. You do this by configuring TidyTop so that items disappear based on their modification or last-opened dates. For example, if you configure the window to read Select Items Whose Last Opened Date is Older Than 7 Days, click Select, and then click Archive, those items that you haven’t opened in the last week will disappear from the Desktop and be placed in an archive. To make all the Desktop items disappear, set that date to 0 days. To restore the items, choose the Restore Archive command from the TidyTop menu and then choose an archive (by default archives are named with their date and time, though you can change that). Verify that you really want to restore the archive and Desktop items reappear, in their original position (thank you, Jörn!). Simple, affordable, and effective. Just about all you could want from a Mac Gem.